In case you hadn't heard, the 2011 Northern Century got off to an EXCELLENT start Friday night with 42 registered boats. The first two starts (double-handed & fully crewed) got away cleanly only to hit the first of many parking lots at Saddlebag Island. With numerous fits and starts the wind eventually built near Lummi Island for those were lucky enough to get that far. One brave boat went inside Lummi and did well. 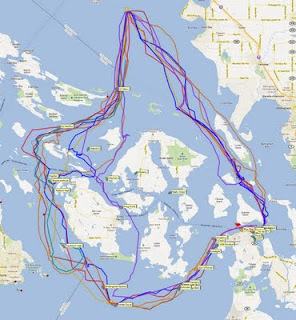 After rounding the Point Roberts mark the courses tended to diverge with most taking the traditional route down Boundary Pass and Haro Strait, although a few took the inside route which resulted in sailing in the fog out through Cattle Pass -- now how is that for a challenge!